When it comes to tallying emissions of greenhouse gases, there is no better substitute than directly measuring the atmosphere. But this important accounting can be obscured, and even confused, if measurements of the air-borne heat-trapping chemicals are inaccurate or can’t be compared from one instrument or data set to the next. To help ensure reliably accurate measurements of the big three long-lived greenhouse gases, the National Institute of Standards and Technology (NIST) has issued two new Standard Reference Materials (SRMs) that are puffs of naturally occurring air from far-flung parts of the globe. 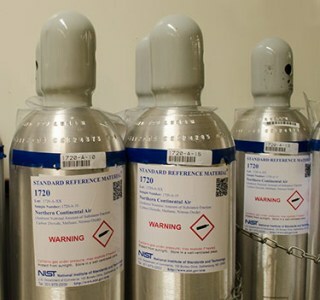 The new NIST-certified references—Southern Oceanic Air (SRM 1721) and Northern Continental Air (SRM 1720)—contain painstakingly measured concentrations of carbon dioxide, methane and nitrous oxide. They respond to the growing need for greenhouse gas calibration standards that extends beyond organizations participating in the World Meteorological Organization (WMO) Global Atmosphere Watch Program, including its North American network. This program is served by a dedicated set of calibration laboratories. A variety of other organizations outside these official monitoring networks also measure greenhouse gases and need tools for ensuring accuracy. They include state and local agencies that track emissions and atmospheric concentrations of the gases; automobile manufacturers, which are particularly interested in leaks and other unintended emissions of nitrous oxide from vehicles; and so-called megacities projects that inventory sources and levels of the gases in large metropolitan areas. To ensure measurement accuracy, these and other types of organizations can first use their instruments to measure concentrations of the three gases in a NIST natural-air SRM. If the results differ from the SRM’s certified values, they can adjust—or calibrate—their instruments accordingly before measuring gas levels in the local atmosphere. The two natural air benchmarks hold the NIST record for lowest uncertainties assigned to components in the agency’s more than 60 primary gas SRMs. The southern oceanic air hails from Baring Head, New Zealand, site of an air-monitoring station situated on a coastal cliff 79 meters above the Pacific Ocean. Samples were gathered in New Zealand at times in which prevailing winds originated from Antarctica. Samples of northern continental air were collected during late winter and early spring seasons in the Rocky Mountains at Niwot Ridge, Colo., a forested area more than 3,500 meters (almost 11,500 feet) above sea level. For nearly four decades, the National Oceanic and Atmospheric Administration (NOAA) has been siphoning the site’s pristine air for its monitoring program and, more recently, for supplying calibrated reference samples to organizations participating in the WMO’s atmospheric monitoring network and NOAA’s tracking system. NIST and NOAA independently measured concentrations of the three greenhouse gases in the volumes of northern continental air contained in aluminum gas cylinders. While the NIST and NOAA measurements were in close agreement, the SRMs’ certified concentrations are taken from the actual NIST assigned values. The NOAA values are included for those users who need to use the WMO-accepted calibration. Among long-lived greenhouse gases, the three compounds account for about 90 percent of what is known as “radiative forcing”—a measure of the compounds’ influence on the balance of incoming and outgoing energy in the Earth-atmosphere system. Carbon dioxide, the most abundant greenhouse gas, accounts for 65 percent of radiative forcing. Molecule for molecule, methane (at 17 percent) and nitrous oxide (6 percent) are much stronger absorbers of the Earth’s reradiated energy, but they are less abundant in the atmosphere. Accurate measurements of known and suspected influences on climate change require a sophisticated, underpinning infrastructure. NIST research chemist George Rhoderick says certifying concentrations of the three greenhouse gases in both natural air SRMs first required developing a set of even more exacting primary standards for each gas. The NIST Gas Sensing Metrology Group, he explains, spent five years developing suites of these primary standard mixtures so that measured NIST-certified concentrations of each gas in the SRMs is linked to the global measurement system. For both natural-air SRMs, pressurized canisters containing the mixture have been calibrated individually. Average values are 390.1 parts per million for carbon dioxide and 0.32 parts per million for nitrous oxide. Average methane values differ by about 6 percent—1.7 parts per million for the southern ocean air mixture and 1.8 parts per million for cylinders of northern continental air. To learn more about the new SRMs, visit their pages at SRM 1720-Northern Continental Air and SRM-1721-Southern Oceanic Air.